That’s one hot bee you got there. Human Fly to the rescue! Save for oddities like Bee 52, Mr. Mosquito, and A Bug’s Life, gaming hasn’t seen many titles starring insects. Whether this lack of insect representation in gaming is good or bad probably depends on your affinity for the creepy crawlies. 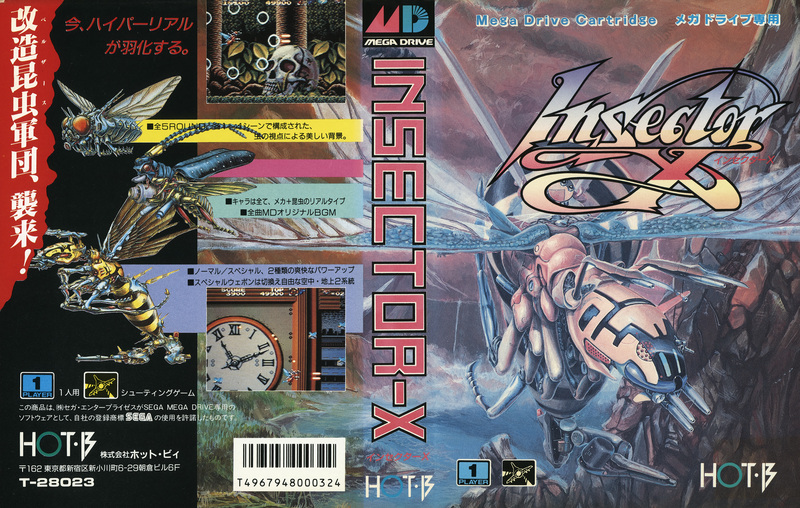 Regardless of one’s position on bugs in games, shoot-em-up Insector X deserves an induction into the highly exclusive “Insect Games” club. You play as a tiny insect-like creature. Most of the enemies, including the bosses, are insects. And the levels succeed at making you feel small in comparison to the world around you. 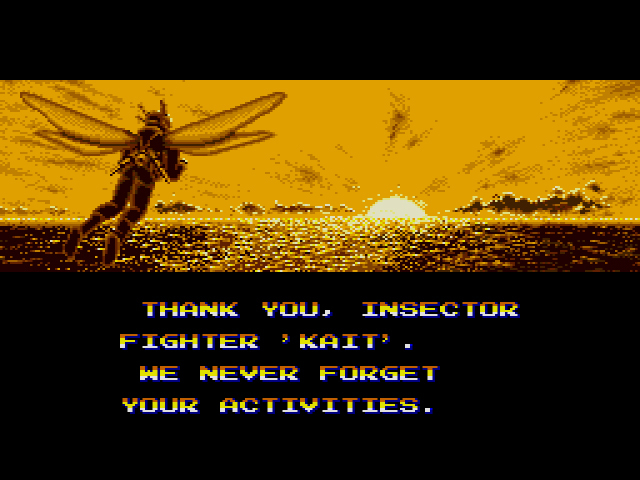 You play as Kait, the last surviving member of the Insector race, and your mission is to destroy the Belzers, an evil tribe who have created half-machine/half-insect forces to carry out their evil bidding. With Kait’s wings guiding your way, you’ll mow down any beetle or spider that looks like it’s equipped with a laser. Not even earthworms were spared in the Great Insect War of 20XX. Kait has two types of weapons, a normal shot and a special shot. The normal shot starts off as a singular laser blast, but can be upgraded up to seven times. The more upgrades you collect, the wider and stronger your blast becomes. Three special shots can also be equipped: a red anti-air weapon, a blue anti-ground weapon, and a Crash weapon that, once used, will hurt everything on screen. Both red and blue special shots can be upgraded up to four times, and with each upgrade, will unleash a different attack. The bosses look intimidating, but they’re surprisingly easy to take down. The anti-ground weapons aren’t worthless, but there are some areas where they’re unusable due to the lack of ground. Because of this, I always stuck with anti-air weapons for the special shot. Because the special shot is linked to the ‘C’ button, and the normal shot linked to the ‘B’ button, you can unload two attacks at once on unsuspecting insect hordes. If your fingers are willing to cooperate, of course. Big Ben, as swell as he ever was. 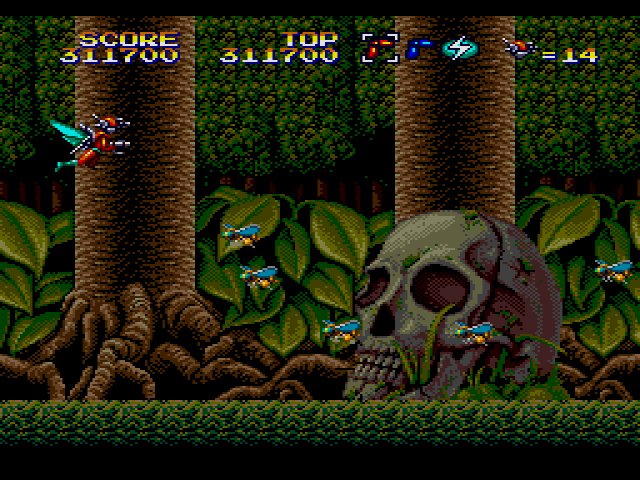 The insect enemies make Insector X a memorable and vicious experience. The Wellfly – a small insect that travels in large groups – flies quickly towards you, drops a projectile, then leaves. The Yonakuni-Thunder shoots laser streams at you, and once destroyed, leaves a projectile that, if touched, will destroy you. Others like the Black Cutter or the Hammer Saw take several hits to kill and are basically sub-bosses that fire pattern-based attacks. Throw all these buggers together in one murderous swarm and you will die, time and time again. 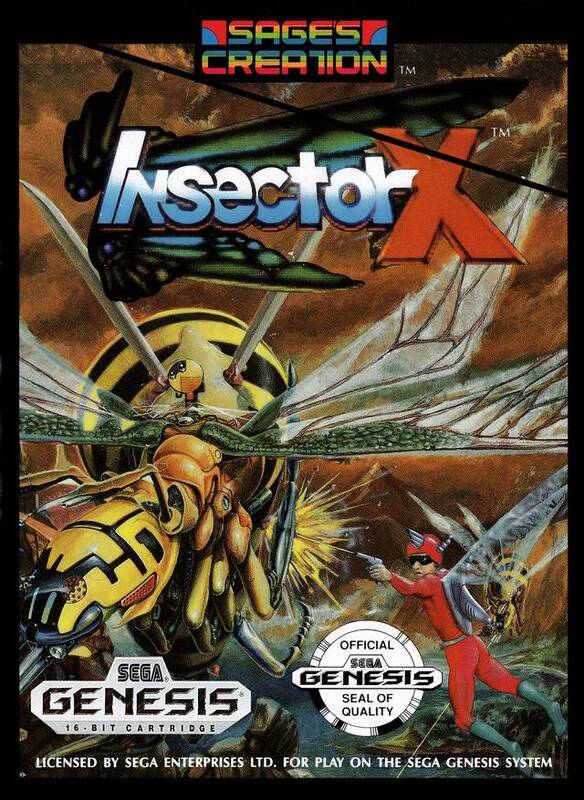 Because the mechano-insects spare no expense in trying to kill you, Insector X starts off challenging and, by the fifth and final level, becomes insane. Even if your arsenal could level the entire insect kingdom, the little jerks know how to exploit your movements. Stray projectiles home in on where you’re moving towards, rather than where you are in the moment. There are certain sections in each level that are so filled with enemy projectiles that it’s impossible for you to move anywhere. 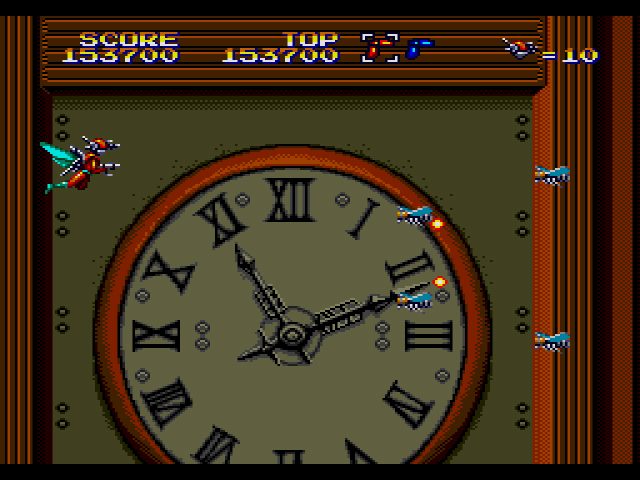 And as with most shoot-em-ups, once you die, your weapon upgrades disappear, leaving you with your initial piddly blast. At least your death(s) will take place amidst beautiful environments. The backgrounds are detailed and haunting. Take the City Area (actual name of the level) that begins with you flying in front of an all-encompassing clock or the Plateau Area where you fly amidst the blades of grass. One disturbing section in the Belzer Empire has you flying over what appears to be hundreds of bee corpses, presumably insects that died during previous battles. All of these areas and others remind you that, despite your weapons of war, protagonist Kait is but a speck upon the earth. So you’re the one making it rain bee corpses. 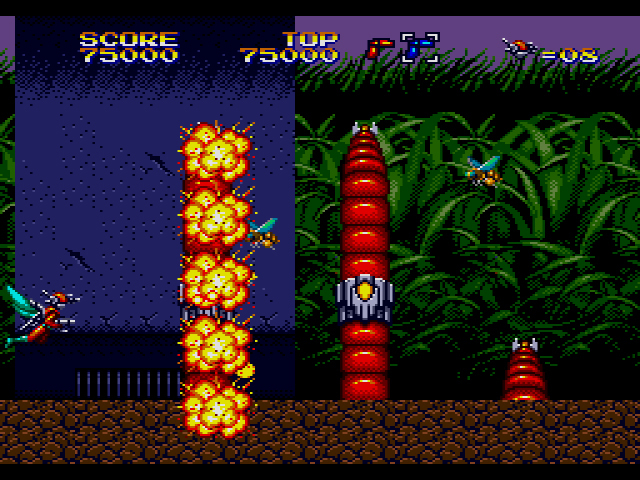 The Genesis version of Insector X is different from both the original Taito arcade and the Famicom port. 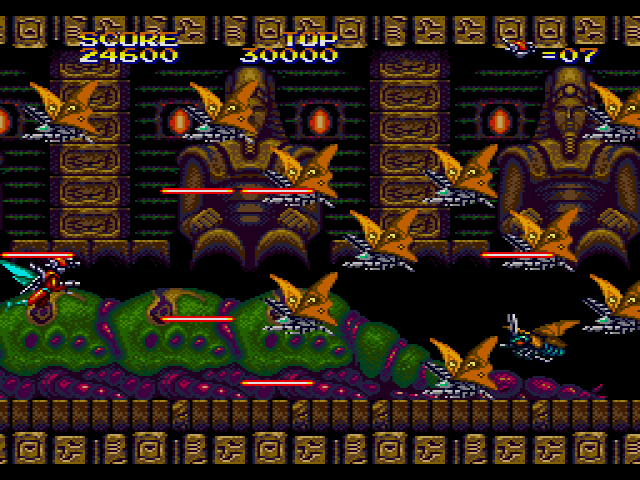 Whereas the Genesis version opted for a darker, more apocalyptic feel, the arcade and the Famicom port have colorful, cartoony graphics and a lighthearted atmosphere. 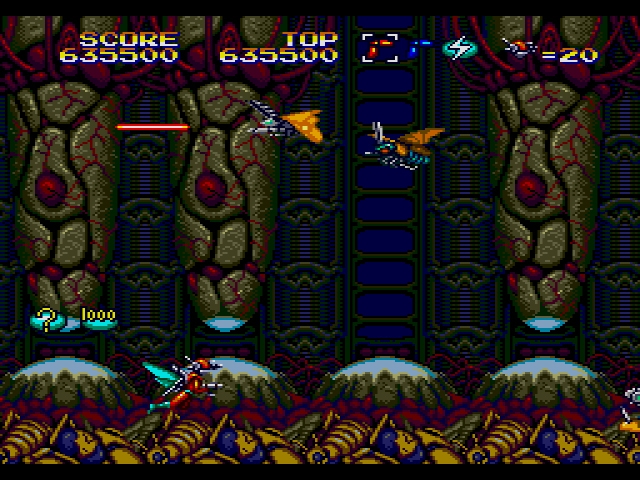 SegaRetro theorizes that HOT-B bought the rights to Insector X from Taito and gave the game “a complete aesthetic overhaul, with a more serious player character and enemy force, and a completely replaced soundtrack” (Insector X). This theory makes sense, but outside of SegaRetro’s Insector X writeup, I couldn’t find any evidence to support it. The way to stand out in a limited genre like the shoot-em-up – without trying too hard – is to stick to the genre’s basic fundamentals, but provide unusual window dressing. To that end, Insector X succeeds. The rare madcap insect theme and the gorgeous pseudo-futuristic world are the attractions here. Without these reasons for being, the generic action and levels that often feel like repetitive death marches would damn Insector X into the shoot-em-up boneyard, forever and ever, buzz buzz. This was another one I had growing up, and man was it tough. I think I only ever managed to beat the first level once as a kid. Yeah, the later levels are crazy. Without save states, there’s no way I would have beaten this. Seeing some of those screen shots, I’m impressed you made it through, even with save states. Great looking pixel art, especially for such an early game. The insect theme was actually fairly prominent in the late 70s and early 80s, and more so if you count arachnids/myriapods etc. A few that spring to mind are Centipede, Ant Attack, Sim Ant, It Came From the Desert, Army Ants, Black Widow, Galaxian and Galaga. Even the first Worlds of Ultima spin-off had a story centred around an ant invasion. It was pretty quiet on the console front though. I thought you might have Apidya coming up soon, but it appears to have been limited to the Amiga/ST/etc. Good point about the arcade/computer stuff. I totally blanked on Centipede, Millipede, etc. Maybe it was just the consoles that were, uh, “deprived” of insect games. Never played this one, did hear the name and thought it sounded interesting. Just wanted to mention the box art – another great Japanese Mega Drive cover! Wish we had the same box art in the UK. I enjoyed this game. 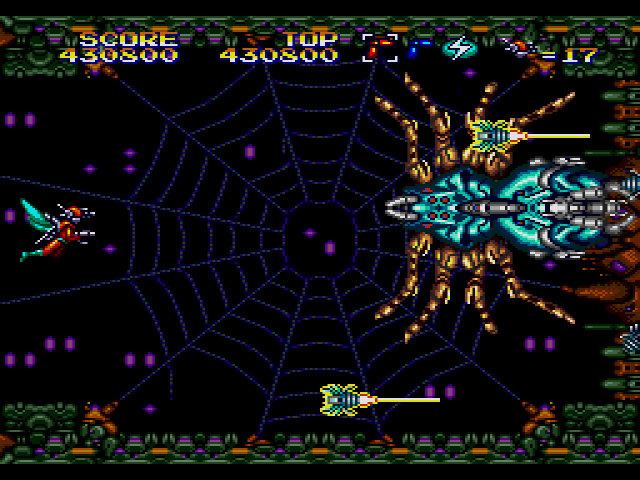 Mostly because of the cool looking bug bosses. I think if you look early on, the Genesis had a glut of shooters. It’s main genre probrably first year or two. Oh yeah, I can’t believe how many more I have left to play. This is one of the blandest shooters ever devised. The backgrounds are weak with like no parallax at all. They don’t even transition correctly. I will take your comment and apply it to XDR. The original cover art looks gorgeous. I might get it just to put it on my shelf. 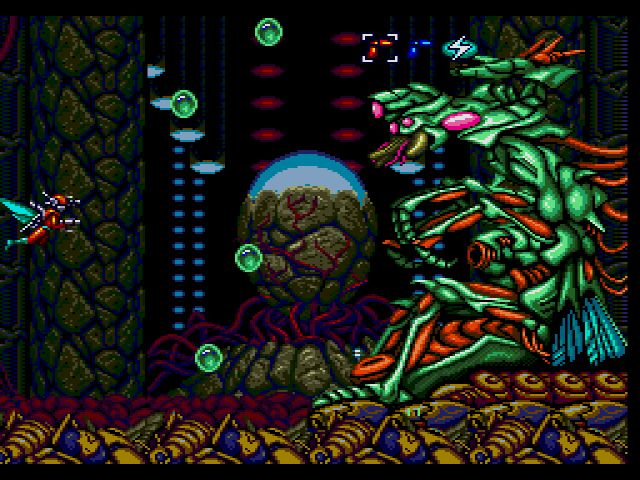 The arcade original had the more cutesy protagonist and enemy sprites, but the backgrounds had that more serious, dark feel to them, so in a way, the Genesis port took the look and feel of the backgrounds, and just translated that to the foreground objects and sprites. The Amiga port also retains that cutesy feel, from what I’ve seen. I never quite took to this game. It’s just kind of bland, aside from the nice areas and such. The power-ups feel kind of generic, the presentation is fine, but uninspired, and aside from the arguable improvement in aesthetic appeal over the arcade original, is definitely one of the lesser shmups in the Genesis library. Still, I’m glad I have a copy, and hope to get a 1CC of it at some point when I can muster up the gumption to try again. It’s nothing *too* special, but after playing yet another Shooter in Space, I was happy to blast some large robo bugs. A solidly made game. I always like shooters that try to do something different even if its only aesthetically which if you break it all down its the theme/style of the game that really separates it from the rest of the shooters out there. I had never heard of or played this game until your review. I really like this game, which means a lot cause I usually don’t like shooter games (cause I’m really bad at them). It’s an original concept for a shooter, and it’s fun to play… it’s challenging but not unnecessarily difficult like a lot of other games in this genre. I’ll be playing this one again!